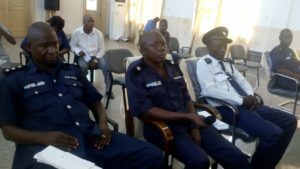 Members of the Parliamentary Committee on Internal Affairs have cautioned police officers attached to the Massingbi –Motema checkpoint, (Kono district and Tonkolili district) that they should stop conniving with local councils to illegally extort monies from poor people living in that part of the country. Chairman of the Internal Affairs Committee, Hon. Alusine Kanneh, said the officers were summoned as a result of a complaint forwarded by Hon. Hafiju Kanja of Constituency 18, Kenema district, that a checkpoint has been mounted between Konike-Massingbi-the road leading to his constituency. The Member of Parliament complained that police were using the said checkpoint to exploit his constituents. He said the committee was concerned about the issue as the Speaker of Parliament had called upon them to treat it with the seriousness it deserves. “I am urging you to treat this issue seriously. It is not a novelty that there are people in this country that are banking on exploiting poor people. It is really pathetic. You are there to take care of the people and protect their properties, and not to extort from them. We will be visiting that area anytime soon without your notice. If we find out that the checkpoint is still there, we will not hesitate but to recommend your dismissal,” he threatened. Hon. Kanja told his colleagues that he had informed Paramount Chief Bai Kurr Sanka III about the said checkpoint, but that the latter had told him that he had no knowledge about it existence. He explained that the then Officer in Command at Massingbi told him that the checkpoint was not directly manned by the police, but rather the chiefdom council who used it to collect dues, an allegation the paramount had denied. “When I was informed about the issue, I spoke with Chief Bai Kurr, but he told me that he was not aware of such development. There are four border crossing points but only one checkpoint was mounted leading to my constituency. A lot of complaints have been made. I also spoke with the then LUC at Massingbi and Magburaka sometimes last year, but nothing was done to address the issue,” he said. He told his colleagues that his constituents were coerced to pay Le10, 000 each for a jerry can of fuel, a bag of rice (50kg) and Le5, 000 for 25 kg of rice at each check point. “I cannot tell how much they demand from commercial bike riders or even passengers on a daily basis. This is bad for our people and it’s a concern for us as MPs,” he stressed. However, Local Unit Commander at Magburaka, Usman S. Amara, said he was never informed about the existence of the checkpoint, but only came to know about it when he received the summon letter from parliament. “I was never informed by my predecessor about the said checkpoint, but no sooner I received the letter than I went to the place to have first-hand information. I was told that the chiefdom authorities were demanding for these monies. I commanded them to immediately remove it without hesitation and as I speak nothing is there,” he told committee members on Tuesday. The LUC stated that the Paramount Chief was informed about the issue, but that he made it clear that dues should be collected only when people display their goods in the market and not at checkpoint. On his part, ASP Osman Kargbo attached to Massingbi, said the checkpoint has been in existence since 2002 for the security of vehicles and goods plying in and out of the communities. “It is true that there is a checkpoint there and I detailed two officers every day, but I never knew of any harassment of such. At the time the MP complained about the issue, I was only there as Administrative Officer and not LUC by then. But I could not ascertain whether our LUC cautioned the officers or reported the issue at Magburaka then,” he said. Committee member, Hon. Saidu Babah Kamara, alleged that the local councils have been extorting monies from people, but the police never stopped them from doing such, hence they were conniving to do same. Meanwhile, ASP Kargbo argued that the Sierra Leone police was in charge of the checkpoint, but that the chiefdom police were the ones collecting dues. “The Police attached to the checkpoint only report cases of bike riders which are sent to Magburaka for redress,” he said. Another committee member, Hon. Francis Bhendu, said the Paramount Chief should be the one to substantiate as to whether he has been informed adequately about the issue, as he was one of the administrators of the council. He urged both LUCs to get a police patrol unit to go round the border crossing points, instead of mounting checkpoint to extort monies from the poor masses . Hon. Bhendu said the Committee on Local Government would be informed accordingly, so that they would engage the local councils and chiefdoms on the collection of their taxes and dues respectively. But Superintendent Augustine Kabia attached to the Motema police post, Kono district, said most times the local councils requested their support to collect local taxes and chiefdom dues which sometimes led them to the erection of checkpoint. “But now that the committee has told them not to erect any checkpoint, they will inform the people and the Paramount Chief with immediate effect,” he said. What due do you collect from check popints, ithougght dues are for goods being sold not those boubght for personal uise and not displayued for sales. Why do we actualy need such number of internal check points, just why.